The Manchu rulers of the Qing dynasty (1644 - 1912) originated in northeast China where their ancestors lived mainly off hunting, gathering and limited agriculture. The Manchus saw the hunt as practice for warfare and their military was organized much like they would be for large scale ring hunts. This lifestyle also reflected in their weapons; their armies were equipped with a rather short range heavy hitting bow that was mainly designed for the large game hunt. 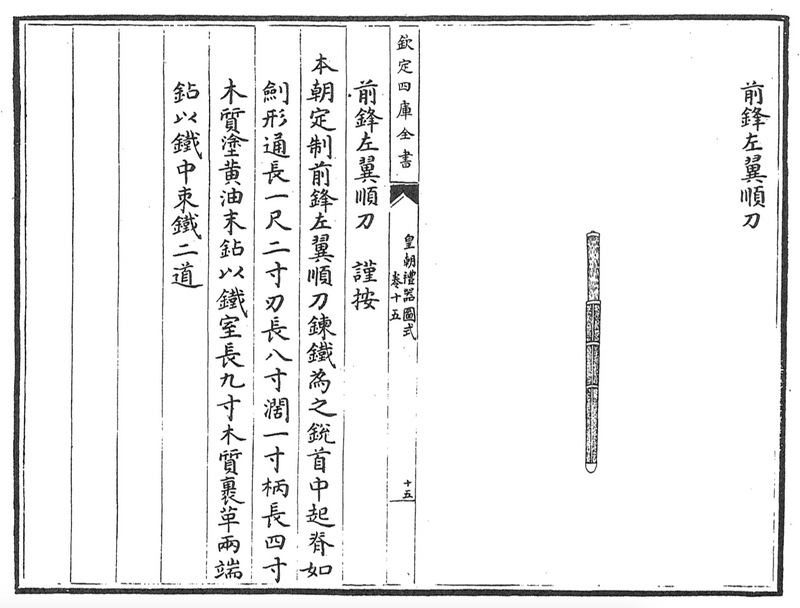 Their elite units would use other large game hunting tools like tiger spears, and their vanguard units were issued large hunting knives, or shùndāo (順刀), called seleme in Manchu. These were probably used as outdoor knives for hunting, to clear areas for tents, etc. but would serve just as well in close combat. Made of forged iron. I has a sharp tip, and a ridged cross-section shaped like a Chinese straightsword. The handle is 4 cun long, oiled, and made of wood, It has an iron pommel. The scabbard is 9 cun long and covered with leather. It has iron fittings on both sides and two iron bands in the middle. A Manchu hunting knife or seleme . Strictly utilitarian but well-made. It's larger than the version issued to the Eight Banners Vanguard, but otherwise of similar form and construction. The blade has two narrow grooves and the tip is double edged, like the regulations describe. 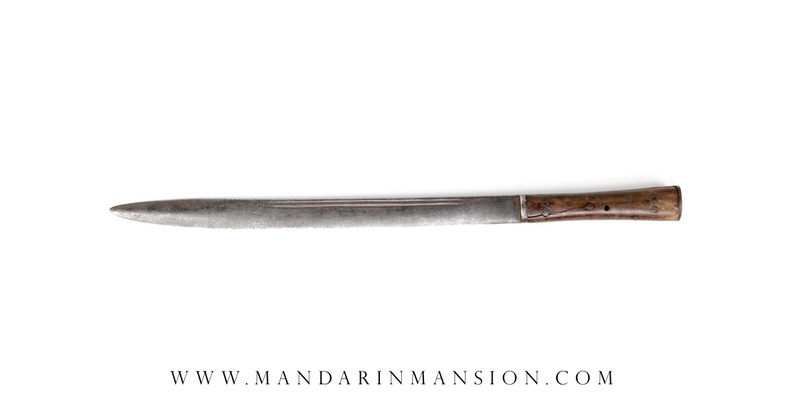 The handle consists of two wooden plates riveted to the full tang, the pommel plate is integrated into the tang. In original, unrestored condition. There is some play in the handle plates. A large practical hunting / outdoor knife, very similar to those issued to the Manchu Vanguard of the eight Banners. Such knives are getting increasingly hard to find, especially in original, untouched condition.